Are Romney’s China complaints campaign rhetoric or genuine belief? Either way, he must resist ideologically pleasing solutions that risk military overreach. During the recent visit of Chinese heir apparent Xi Jinping to the United States, Mitt Romney lambasted the Obama administration for approaching Beijing as a “near supplicant” and permitting “the dawn of a Chinese century” to continue unopposed. The way forward: tougher economic penalties to reverse Washington’s “trade surrender,” and an invigorated military presence in the Pacific to force China to abandon its dreams of regional hegemony. The conventional reading of Romney on China suggests that such chest-thumping rhetoric will fade with the election, giving way to the mainstream consensus that pairs economic and diplomatic engagement with strategic hedging. Though this is at least partially true, leaving the next administration’s China policy to the learning curve is still risky. Romney’s tough talk on China conceals some profoundly deterministic – and pessimistic assumptions – about the future of U.S.-China relations that could accelerate existing momentum for future confrontations. Without a critical appraisal of U.S. interests and capabilities, Romney could do both too much and too little to manage the frictions generated by an increasingly assertive China in Asia. Too much in that an overly aggressive and militarized response against China could set the two great powers on a collision course, and too little in that poorly-conceived interventions in other regions could force the United States to divert its attention and resources away from Asia, sending disturbing messages to China and U.S. allies alike. It would be tempting to dismiss Romney’s broadsides against the Obama administration’s China policy as red meat for the electorate. But the obligatory notes about currency manipulation mask a coherent, if troubling narrative of the future U.S.-China relationship, most likely authored by neoconservative advisors on the Romney team. 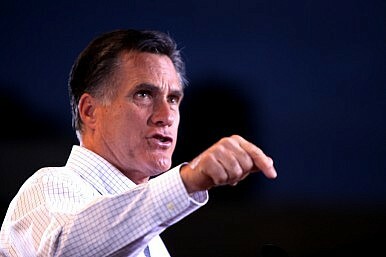 When Romney warns that “a China that is a prosperous tyranny will increasingly pose problems for us, for its neighbors, and for the entire world,” he appears to be channeling the neoconservative school of thought that sees China’s Leninist, one-party regime as an insurmountable obstacle to strategic trust that will inevitably drive the two powers to clash. Robert Kagan and Aaron Friedberg, prominent members of his foreign policy team, have argued that an authoritarian political system distorts China’s strategic calculus, so that it sees the United States and its democratic allies as co-conspirators in an effort to throttle the nation’s growth. Given such deep-rooted beliefs, according to this view, China will have little choice but to overthrow the U.S.-led alliance system in Asia, and reconstitute a sphere of influence on its maritime periphery. As for the appropriate response to this alleged provocation, Romney largely echoes his advisors. Only by pouring more resources into a military buildup can the United States steer China away from “the path to regional hegemony” and toward the course of a responsible stakeholder. Expectations of a “contest for supremacy” in the Pacific may have driven Romney to promise to expand the U.S. navy by fifteen ships per year, compared with the current nine. Not all of Romney’s advisors offer such dire predictions about the future of U.S.-China relations, though the images and assumptions of neoconservatives have featured most prominently in his statements to date. Even the most hawkish of Romney’s advisors have no desire to revisit the horrors of Iraq in the Pacific. Rather, they believe that only a highly militarized response can compel a rising China to yield to the reality of U.S. predominance in the region. The aim is to extend the relatively peaceful status quo – with its broadly favorable terms for the United States, such as the ability to conduct unfettered surveillance along China’s eastern seaboard – into perpetuity. But these ideological assumptions could be more problematic if translated into military strategy. As China expands its inventory of capabilities, the U.S. military is devising battle plans ostensibly aimed at neutralizing those systems and maintaining its superior position in maritime Asia. One unsettling possibility is that Romney could endorse aggressive proposals with little regard to their long-term cost and feasibility, imprinting an ambitious, even dangerous vision of great power competition on defense planning for a decade or more. Championed by the air force and navy, the Air-Sea Battle Concept has emerged as one answer to China’s (and to some extent Iran’s) growing ability to control its maritime reaches. One likely version of the concept envisions an array of high-tech systems working in concert to destroy an enemy’s anti-access arsenal, from long-range stealth bombers that could strike targets inland to missile-armed submarines to cripple Chinese coastal defenses. Preparations for elements of Air-Sea Battle are already underway in the Air Force and Navy. Yet Romney could be tempted to commit to a more extensive array of strategies, doctrines, and capabilities associated with the plan, going beyond the nebulous endorsement offered in the recently released Joint Operational Access Concept. However, the success of that effort would hinge on some shaky assumptions. Crucially, Air-Sea Battle presumes the U.S. military will be able to break with its troubled record in acquisition to rapidly develop, build, and integrate an extensive suite of high-tech weaponry into a new force structure. Yet delays, interruptions, and cost overruns have dogged the programs that will likely underpin Air-Sea Battle. From the previously aborted long-range stealth bomber to the technologically challenged littoral combat ship, no system has emerged unscathed. Given his pledge to reverse the Obama administration’s defense cuts, Romney might try to spend his way out of this conundrum. But pouring money into acquisition accounts wouldn’t necessarily ensure quantum leaps in military innovation within a short time frame, nor would it necessarily produce more discipline in development, testing, and production – indeed, the result could be just the opposite. Soaring personnel costs and anemic economic growth could also torpedo the dream of a truly integrated, next-generation air force and navy. As a result, Romney over-promises and under-delivers in attempting to preserve an overwhelming margin of conventional superiority in Asia. If Air-Sea Battle were to fail, a China rendered even more paranoid than at present by fears of encirclement could have few qualms about testing the resolve of a vulnerable United States, perhaps in a higher-stakes replay of the EP-3 or Impeccable incidents. The reality is that even a well-funded, fully realized Air-Sea Battle could fall short of its goals to deter China and reassure U.S. allies, setting the two powers on a collision course instead. Part of the problem lies with the weapons that both parties are assembling. To counter Chinese missiles that could sink an aircraft carrier, for example, the United States is building radar-evading bombers that could destroy major military installations within the Chinese mainland. And in the absence of deeper high-level military contacts between the nations, each countermeasure would simply confirm the worst suspicions about the other’s intentions. In a raw, militarized form, untempered by substantive mutual security assurances with China, Romney’s vision for an “American century” in the Pacific could fuel a vastly more intense arms race than at present, polarizing the region when few countries want to align themselves explicitly with either nation. Military overreach in competing against China would be costly and dangerous, but another scenario would see the opposite extreme play out in U.S. policy toward Asia. If conflict breaks out over Iran’s burgeoning nuclear capabilities, a Romney administration could find itself drawn back into the vortex of the Middle East, derailing its engagement in Asia and sending a message of abandonment to the region. Tempting as it is to see the recent “pivot” to Asia as an inevitable correction in the policy cycle, a new president would be hard pressed to give security relations in the region higher priority over metastasizing crises in the Middle East. Romney has attempted to stake out a hard line on Iran, promising to strike the country if it were to obtain nuclear weapons and arguing that only “regime change” can secure peace. But even if his more sober instincts were to prevail, an Israeli strike could present the United States with a fait accompli, igniting a region-wide conflagration. The United States could find itself fighting an asymmetric war against Iran and its proxies to protect oil shipments, American bases, or allied nations such as Israel. The immediate demands of stabilizing the region could force hasty revisions of the Pentagon’s twenty- to thirty-year blueprint for a sustained presence in Asia. The consequences of a diplomatic drawdown in Asia could be similarly severe. Given the growing discourse of American decline and Chinese resurgence today, a sudden reversal of Washington’s multilateral initiatives in Asia could send a message of genuine abandonment. Perceptions of a leadership vacuum could drive China to miscalculate and push more aggressively on territorial claims. Neighboring states such as Japan or Vietnam could be forced to choose between band-wagoning or developing an independent deterrent. American promises to mediate disputes over the East or South China Seas would ring hollow in light of its commitments elsewhere. If elected, Romney would have to resist ideologically pleasing solutions that risk military overreach in competing with China, or conversely, political and diplomatic neglect of Asia. Both extremes could trigger the worst impulses in Beijing’s behavior toward its neighbors. Ideally, he would find a more optimal mix of policy instruments to shape a rising China’s calculation of its interests. But the United States will also have to re-examine how it defines its strategic interests in Asia, and the costs it is willing and able to bear in defense of those interests. The longer the next administration delays in making this assessment, the more painful the inevitable reckoning will be. Michael Swaine is a senior associate at the Carnegie Endowment for International Peace. Raymond Lu is a junior fellow at CEIP. This is an edited version of an article that was originally published by the organization that appeared here. Can China Crash U.S. Pivot Party? The United States is working hard to recalibrate its national security strategy with an Asia-Pacific focus. If China can act boldly, it has multiple avenues for countering it.